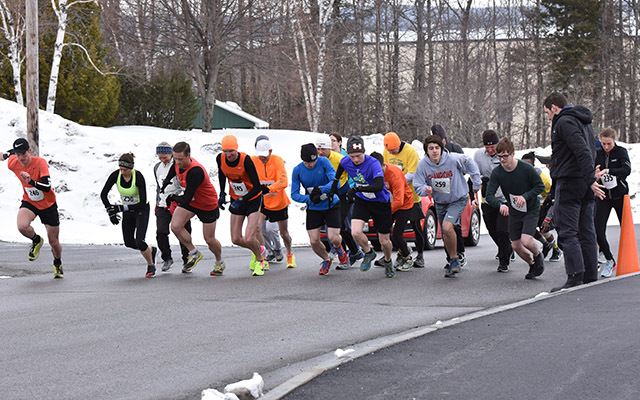 The 39th annual UMPI Spring Runoff 5K Road Race takes off Saturday, April 6, from the campus of the University of Maine at Presque Isle, with walkers beginning at 9:30 a.m. and runners at 10 a.m.
PRESQUE ISLE, Maine — The 39th annual UMPI Spring Runoff 5K Road Race takes off Saturday, April 6, from the campus of the University of Maine at Presque Isle, with walkers beginning at 9:30 a.m. and runners at 10 a.m. This second race in the County Challenge Series is a fund-raising effort for the University of Maine at Presque Isle cross country and track and field programs. The UMPI track team has completed two meets of its 2019 outdoor season having traveled to Bridgewater State University and UMass Dartmouth the last two weekends. The teams travel to both Regis College (Weston, Massachusetts) and Bowdoin College this coming weekend. The Spring Runoff course records for the five kilometer race are held by Gabrielle (Cyr) Wheeler at 18 minutes, 46 seconds (set in 2012) and Curtis Wheeler at 15:33 (set in 2010). Registration for this year’s race begins in Wieden Gymnasium at 8 a.m. Runners may compete in age specific women’s and men’s categories, as well as in a three-person relay division which will allow inexperienced and shorter distance racers to participate. Results will be compiled and added to those from the Katahdin Trust Snow Run held in Houlton on Feb. 2 as part of the Aroostook Musterds Running Club’s 2019 County Challenge Series. Current Series leaders is Thomas Beckum of Caribou due to his first-place finish at the Katahdin Trust Snow Run. For more information on The Spring Runoff 5K, contact Chris Smith at 207-768-9472 or at christopher.smith@maine.edu.